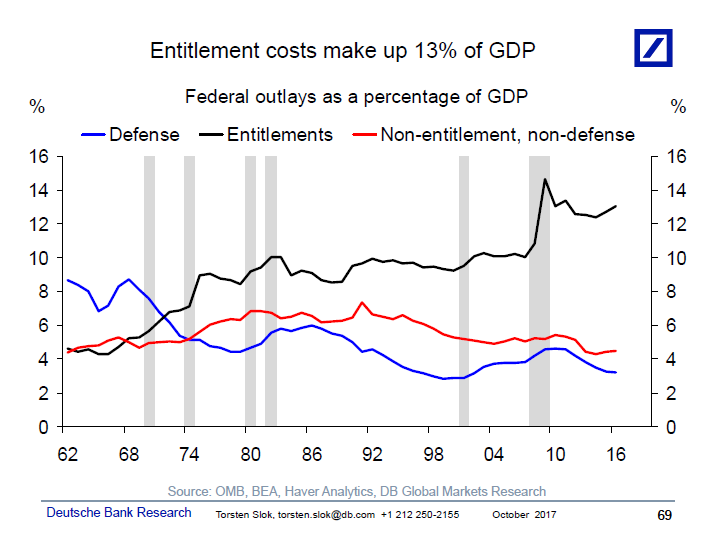 1.Annual Cost of Entitlements Now 13% of GDP. This could be the first calendar year with positive returns every month. With a 2 percent gain in September, the S&P 500 Index has set a record: positive returns 1 in each of the first 10 months of the year. There’s never been a full calendar year when this has happened every month. Going back to November 2016, the index has ripped off 12 consecutive monthly gains. The S&P hasn’t had a down quarter since the third quarter of 2015, a streak of eight in a row without a loss. Since the start of 2013, 18 of the past 19 quarters have been positive. And it’s not like stocks are melting up either. They are going up slowly as volatility is slowly going down. Not only have stocks been consistently profitable recently, but they have done so with remarkably low volatility. 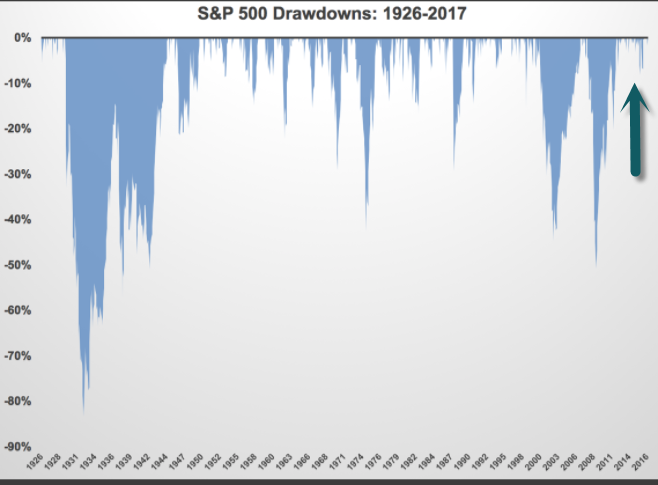 This year, there has yet to be a 2 percent move up or down on the S&P 500. For a frame of reference, in 2009, there were 55 separate 2 percent up or down days and there were 35 in 2011. The annualized volatility of daily returns on stocks since 1928 has been 18.7 percent. For 2017, that number is 7 percent, a little more than one-third of the long-term average. 3.90 New Cryptocurrency Hedge Funds in One Year. Data shared exclusively with CNBC from financial research firm Autonomous Next shows the number of funds investing in digital assets like bitcoin has grown rapidly to 124. Autonomous Next also estimates that the “crypto-funds” have about $2.3 billion in total assets under management. While several leading Wall Street banking executives remain skeptical about bitcoin, more seasoned money managers are moving into digital assets management. More than 90 funds focused on digital assets like bitcoin have launched this year, bringing the total number of such “crypto-funds” to 124, according to financial research firm Autonomous Next. Data shared exclusively with CNBC Friday showed that the largest share of the funds, 37 percent, used venture capitalist-type strategies and had about $1.1 billion in assets under management. Funds focused on trading digital assets came second at 32 percent, with about $700 million in assets under management. Funds specifically using machine learning, data science or statistical arbitrage on digital currencies came in third at 10 percent and $100 million in assets under management, the data showed. 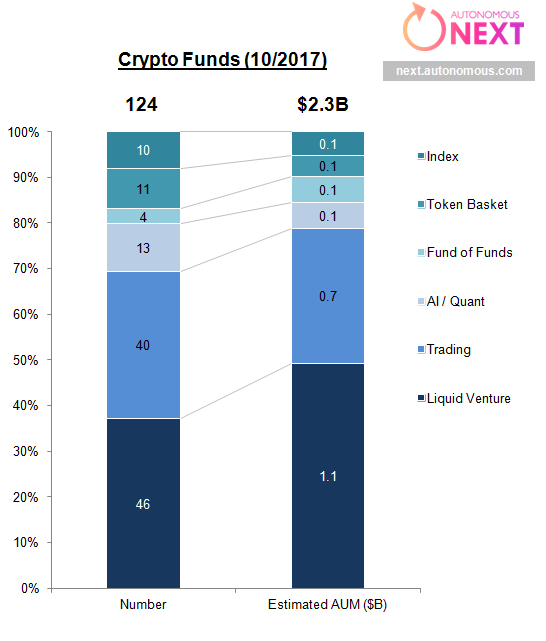 Total assets under management by crypto-funds now stands at $2.3 billion, according to Autonomous Next’s estimates. 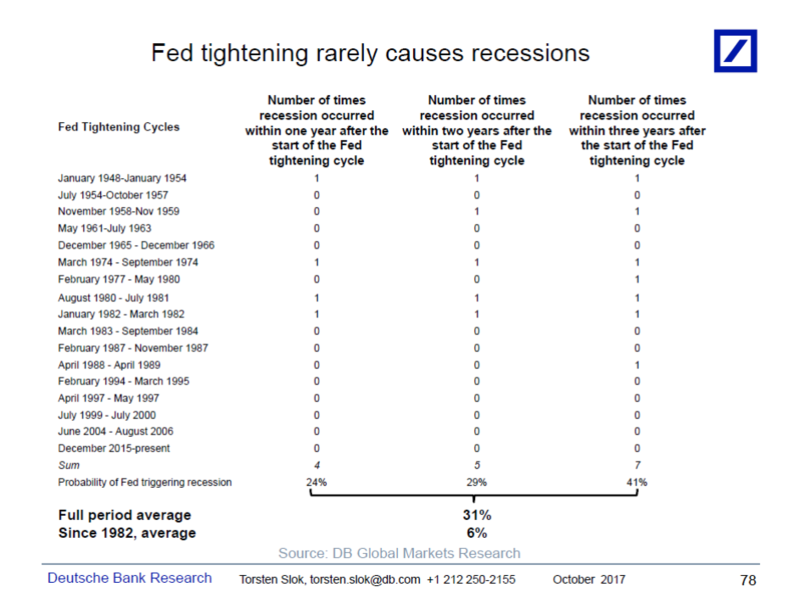 4.Fed Tightening Only Results in Recession 36% of Time. I often meet investors who argue that long rates will stay low throughout this entire cycle because “Fed tightening always results in a recession.” But the data below shows that Fed tightenings rarely result in a recession. In fact, since WWII Fed tightenings have only resulted in a recession 31% of the time, and since 1982 only 6% of the time. Looking ahead, once core PCE inflation starts moving back up toward 2% in 2018H1 – as we, the consensus, and the Fed expect – then rates investors will begin to realize that there is no recession on the horizon and therefore short rates, the belly, and long rates be significantly higher than where they are today. And chances are that the economy will do just fine. For more discussion see also our recent piece: The next US recession. Happy to discuss further, let your DB sales contact know. 5.The Real Bull Market….Longest Bond Bull in 500 Years. LONDON — We’re currently living through the second longest bond bull market in recorded history, and the longest since the 16th century, according to a new research paper from the Bank of England. Written by Paul Schmelzing, a Harvard PhD candidate currently working with the bank, the paper, titled “Eight centuries of the risk-free rate: bond market reversals from the Venetians to the ‘VaR shock’” — explores hundreds of years of data around real rates and bonds. “This paper presents a new dataset for the annual risk-free rate in both nominal and real terms going back to the 13th century. On this basis, we establish for the first time a long-term comparative investigation of ‘bond bull markets’,” Schmelzing writes. 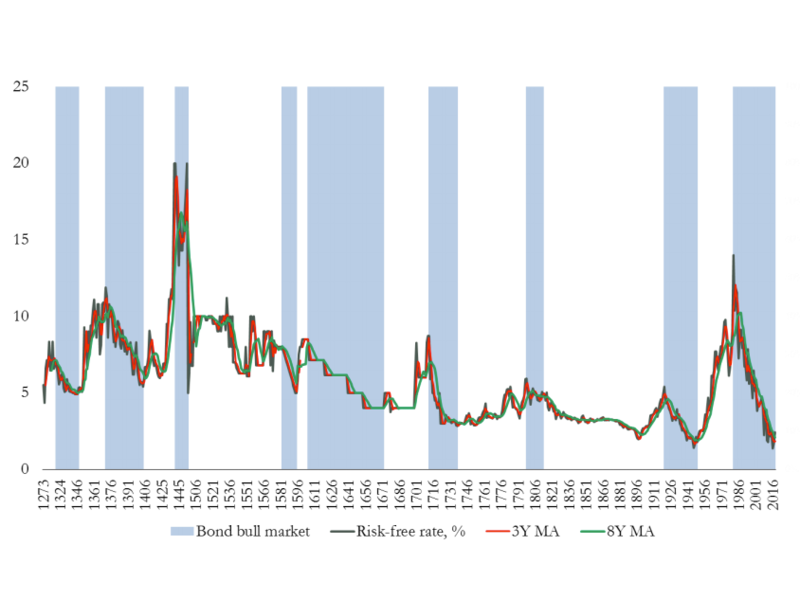 The paper — which started out as an entry on the Bank of England’s staff blog, Bank Underground — argues that the current bull market in bonds is only surpassed by one longer period of growth in recorded history. “The average length of bond bull markets stands at 25.8 years, and the range falls between 61 years (1451-1511) and 12 years (1718-1729). Our present real rate bond bull market, at 34 years, is already the second longest ever recorded,” Schmelzing writes. 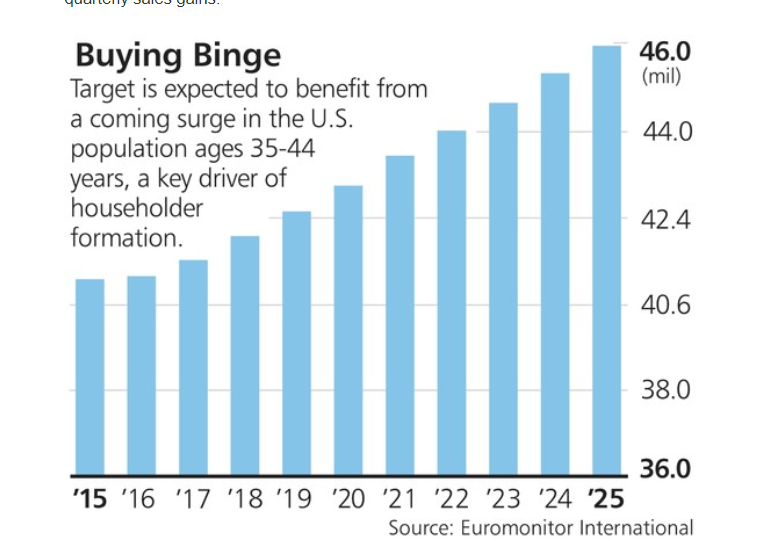 6.Coming Surge of 35-44 Year Olds After 15 Year Decline….Number Could Hit 48 Million by 2030. Jason Clark, a senior portfolio manager at AFAM Capital, cites a coming surge in the number of Americans 35 to 44 years old, after a 15-year decline. This population cohort, responsible for a significant share of U.S. household formation, could total about 48 million by 2030, according to Euromonitor International, up from roughly 40 million now. As younger adults marry, buy homes, and have children, says Clark, many will look to Target for its wide selection of low-priced but trendy “stuff” for their kids and homes. 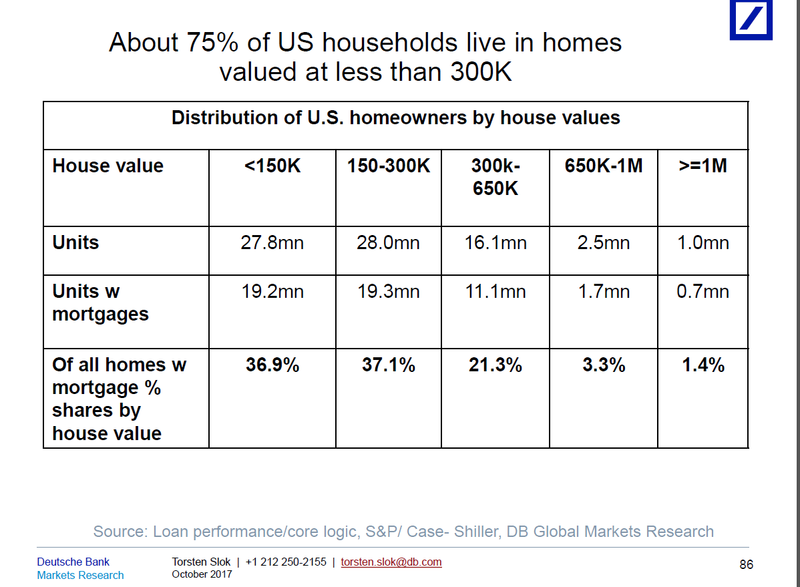 7.America is a Nonprime Nation….Two-Thirds of Americans Have a Nonprime Credit Score Below 700. 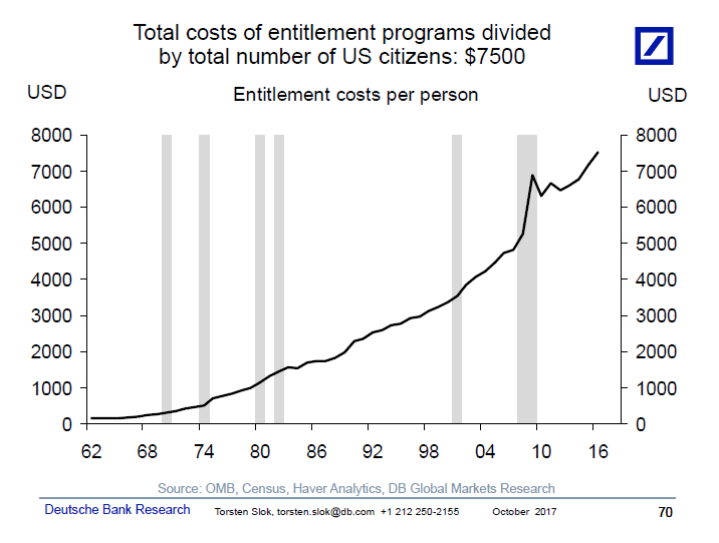 America is a nonprime nation. 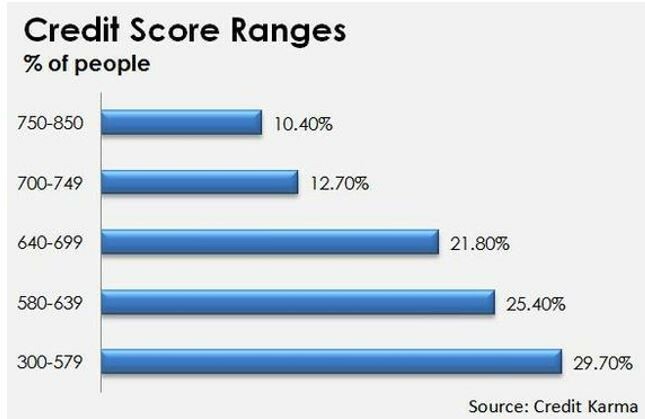 An astounding two-thirds of Americans have a nonprime credit score (below 700) or no score at all, according to the Corporation for Enterprise Development and FICO. 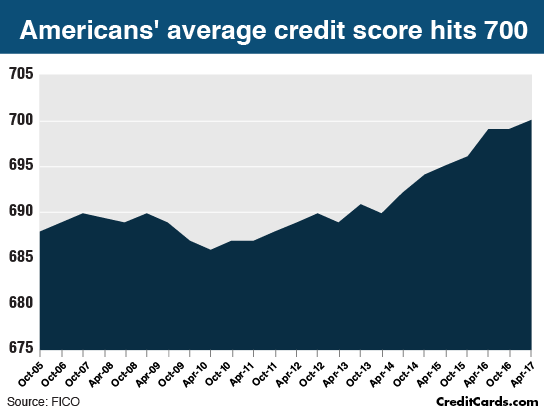 Due to high credit-score requirements, some 160 million Americans find it difficult or impossible to access traditional bank credit. The way for banks to grow and better serve their communities is to figure out how to lend again, safely and profitably, to a much broader range of customers. Banks need a new generation of nonprime credit products. The Good News is Improvement Since Great Recession. 8. 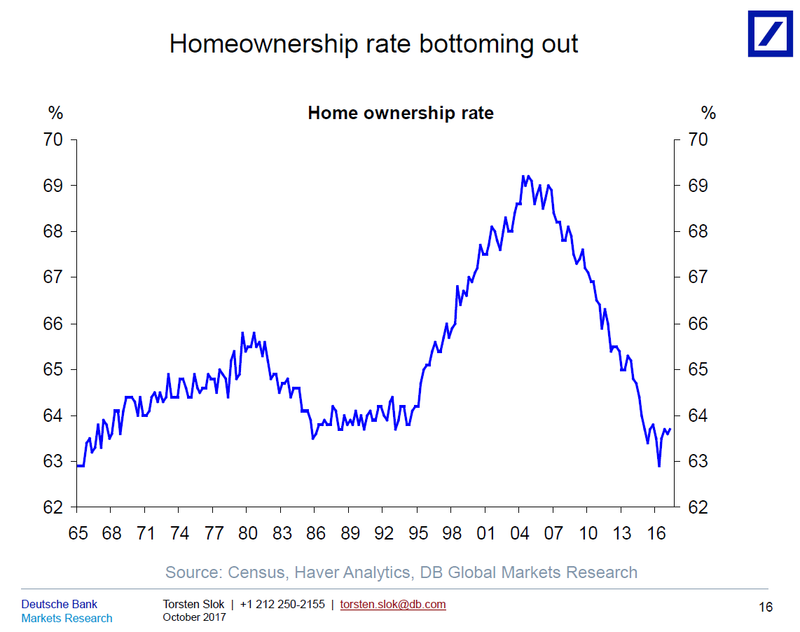 Has the Home Ownership Rate Bottomed Out? Global wine production is expected to fall to its lowest in more than 50 years, according to the International Organisation of Vine and Wine (OIV). The group blamed the decline on extreme weather in Italy, France and Spain – the world’s top three producers. Total world output is projected to fall 8% from last year to about 247 million hectolitres. This could raise prices and dissipate a global surplus caused by a demand slump in the wake of the financial crisis. According to OIV estimates, Italian wine production will fall 23% to 39.3 million hectolitres. Levels will drop 19% to 36.7 million hectolitres in France which is predicted by the European Commission to be facing its worst harvest since 1945. Could English wine conquer the world? Meanwhile in Spain, production will be 15% lower at 33.5 million hectolitres. A hectolitre is 100 litres, equivalent to about 133 standard 750mL bottles. As a result, small producers hit by several years of small harvests “are facing the very real problem of having to sell family domains because, unless the banks are going to help them in some way, they’re stuck,” according to Rupert Millar, fine wine editor of industry journal The Drinks Business. “But just how many this is happening to is another question,” he adds. For wine-growing regions outside Europe, OIV’s forecasts are more optimistic. Australian production is expected to rise 6% to 13.9 million hectolitres, and by as much as a quarter in Argentina to 11.8 million hectolitres. Output in the US – the world’s fourth-largest producer and its biggest wine consumer – is also due to fall by only 1% since reports indicate wildfires struck in California after the majority of wine producers had already harvested their crops. There was no data available for producers such as China, which produced 11.4 million hectolitres last year. Free yourself from the chains of resentment. Justifying resentment is like justifying hunger; you never have to do it. You never have to ask yourself, “Is my resentment justified?” The more important question is, “Do I want to be resentful?” If you don’t, you need to understand that justifying resentment strengthens and prolongs it. There’s a neurological explanation for this. Resentment keeps us focused on a perception of unfairness – we’re not getting the help, appreciation, praise, reward, or affection we deserve. Mental focus amplifies and magnifies, whatever we focus on becomes more important than what we don’t focus on. Repeated focus over time forms mental habits. Justifying resentment strengthens the neural connections underlying it, and over time makes it more or less automatic, the default perception of consciousness. Resentful people complain and criticize out of habit. Resentment is likely to become a bedrock of ego-defense, due to its low-grade adrenaline, which temporarily increases energy and confidence. We feel animated by the perception that we’ve been wronged, which feels better than the self-doubt and low energy that often occurs when we feel vulnerable. The problem with adrenaline is that it borrows energy from the future. After a bout of resentment, a crash into some form of depressed mood is inevitable. Worse, adrenaline enhances memory – experience marked by adrenaline is, in general, recalled more easily. (It’s often hard to get it out of your mind.) When you resent your partner, you’ll remember every perceived offense since you started living together. Instead of experiencing negative feelings as temporary states, it seems like you’re reacting to unfair or unreliable behavior that will not change and that overshadows most positive experience. The other problem with adrenaline is that we build a tolerance to it so that it takes more and more of it to get the same level of energy and confidence. That means we have to justify more by amplifying and magnifying more. At that point resentment becomes chronic, the lens through which we see the world. External regulation of emotions – other people seem to control your emotional states – they “push your buttons” or make you feel what you don’t want to feel. Narrow and rigid emotional range – you’re either resentful or numb. We justify resentment by citing evidence of other people’s unfairness.But the adrenaline we need for justification makes us subject to confirmation bias. The human brain is highly susceptible to confirmation bias under the influence of emotion arousal; it automatically looks for evidence that confirms its assumptions and ignores or discounts evidence that disconfirms them. Many studies have shown that whatever the brain looks for, it tends to find, in reality or in imagination. You have an absolute right to your resentment. And you have a more compelling right to a live value-filled life, which is impossible with resentment.